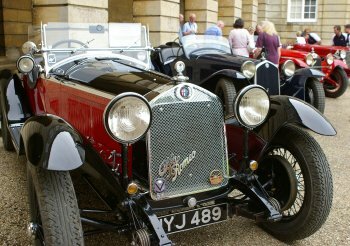 The Alfa Romeo Owners Club UK has arranged a great day of events at the glorious Weston Park Estate on Sunday 24th June when National Alfa Day will see over 1,000 Alfa Romeo cars gathering together with models ranging from beautiful pre-war tourers to the very latest Spider convertible. The Event kicks off at 10am and will welcome members from the Lancia Motor Club who have accepted our invitation to join us as our special guests. We hope to see some fabulous cars from pre-war to the present day. For those of you of an adventurous nature you can join in the specially designed ‘Auto Test’ to be run by our very own Chairman Ed McDonough who will put you through your paces as you complete a set of low speed driving skills. We have a distinctly military theme with the arrival of the Willys Jeep enthusiasts who will be pleased to allow you into their vehicles and even to take a trip around the site as a passenger. Not to be outdone we have been advised that their will be two Alfa Romeo Matta jeeps on show belonging to Steve Ball and James Wheeler. These are extremely rare and there are probably only 3 in the UK at this time. Between 12.45 and 1.15 you will be able to witness more military history as we enjoy a flypast of vintage aircraft including a Spitfire, a Dakota and a Lancaster Bomber (vintage aircraft and weather permitting). The finale to the day will be the Concours D’elegance which will showcase the very best Alfa Romeos that our club has to offer. Just before the Concours gets underway we will have the spectacular Icarus Parachute Display team who will descend from the skies and give a demonstration of their skills, be prepared for vapour trails and smoke trails as they parachute into the arena and bringing with them the Concours prizes. Mangolesti of Knutsford are our Dealer Sponsors for the day, they will bring along a choice of cars and to celebrate their 40th Anniversary they will be donating a ‘Win A Brera for the Weekend’ which everyone will have a chance to win. (Subject to terms and conditions). We also see the return of the Mangoletsi parts sale as they will join us with a substantial amount of new parts for sale. As well as our own Club Shop we will have a range of trade stands for you to peruse. There will be a ‘Cars for Sale area’ also if you wish to part with one of your treasures or indeed if you are interested in making a purchase. Alfa Romeo is famous for its stylish, drivers’ cars, and for anyone with a passion for motoring this event is a must. The Concours d’Elegance will showcase the very best Alfa Romeos, old and new, that club members have to offer. 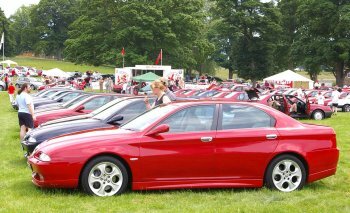 The Alfa Romeo Owners Club UK has arranged a great day of events at Weston Park Estate on Sunday 24th June when National Alfa Day will see over 1,000 Alfa Romeo cars gathering together. For our younger members we will have a treasure hunt and the winners will receive a prize donated by the Club Shop, there will also be an opportunity to showcase their artistic skills in the main marquee where an Artists corner will be set up. Weston Park itself has a huge adventure playground and a miniature railway which will be in use on the day and is offering rides at a small cost. Weston boasts some fantastic gardens offer you the chance to roam among the gardens designed by Capability Brown the grounds also include a deer park, formal and secret gardens and the wonderful Italian Gardens, you can also enjoy woodland walks and a Victorian conservatory and Orangery. Later additions to the grounds also include a yew hedge maze. The house has had many additions to it throughout the generations from the Medieval settlement that now forms part of the deer park, to the house as it stands today, the story of the present house begins in1651 when the twenty-year-old Elizabeth Mytton married Thomas Wilbraham. The house at Weston Park was her vision. In fact, ably assisted by local craftsmen and Palladio’s First Book of Architecture, she appeared to be her own architect. Her heavily-annotated copy of Palladio’s book is a treasured item in the library at Weston. The 18th Century saw the addition of Capability Browns landscaping of the parklands and James Paine was also employed to add his Roman Bridge and Temple of Diana – later described by the renowned architect as “my greenhouse at Weston.” During the 19th Century saw substantial changes and rearrangements. The East Wing, Orangery and the Loggia were added. Modifications were made to the Library, Drawing Room and Tapestry Room whilst the remarkable Dining Room and the Salons were also created. Weston has many rooms open to the public which are truly outstanding and are crammed with treasures including antiques, art, jewellery and fine glass wear.